Spaces and Flows: An International Journal of Urban and ExtraUrban Studies addresses some of the most pressing and perturbing social, cultural, economic, and environmental questions of our times, focusing on spaces and flows as crucibles and vectors of ongoing transformation. Spaces and Flows: An International Journal of Urban and ExtraUrban Studies currently has a 28% acceptance rate, based on 2017 statistics. After nine years of publication, Volume 9 will be the final volume of Spaces and Flows: An International Journal of Urban and ExtraUrban Studies. A complete list of journals published by Common Ground Research Networks can be found here. With more than 200 articles published, Spaces and Flows: An International Journal of Urban and ExtraUrban Studies is a remarkable body of work (2018). 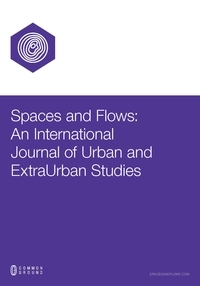 Spaces and Flows: An International Journal of Urban and ExtraUrban Studies currently has an acceptance rate of 28% (2017). The Association of American Publishers (AAP) is the largest U.S. trade association for the consumer, educational, professional and scholarly publishing industry. Our more than 400 member organizations include U.S.-based multinational corporations, independent publishers, university presses, nonprofit publishers, professional and scholarly societies and industry service providers. ALPSP is an international membership trade body that supports and represents not-for-profit organizations and institutions that publish scholarly and professional content. With over 300 members in 30 countries, membership also includes those that work with these publishers. Crossref is a not-for-profit membership organization for scholarly publishing. Crossref and its members work to make content easy to find, link, cite, and assess by using online tools and services to improve research communications. Crossref’s goal is to be a trusted collaborative organization with broad community connections; authoritative and innovative in support of a persistent, sustainable infrastructure for scholarly communication.